After a short presentation, it was downstairs for a Destiny multiplayer session. Activision had set up a seperate area for the game, with the game mode Control on offer. It was all about survival, loot and earning some in-game currency in the form of Glimmer. And the game did not disappoint. 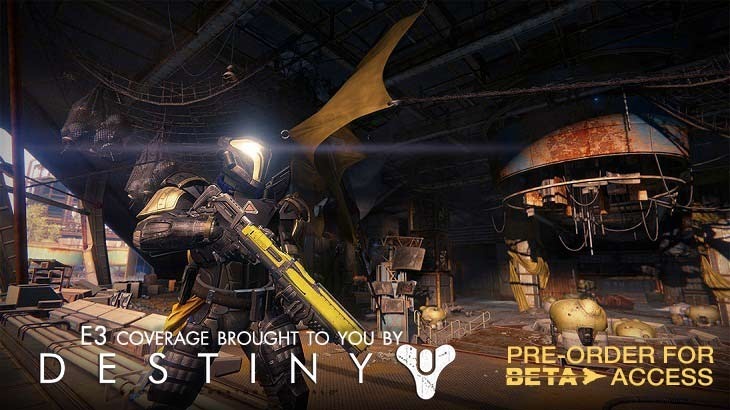 The first thing that needs to be mentioned, is just how gorgeous Destiny happens to be on the visual front. YouTube trailers don’t do it justice, and if you’ve spent a weekend on the alpha, I’m sure you’d agree with me. So how does it play then? There’s no mistaking the fact that it has that Halo DNA inside of it, but the key difference here is that whereas Halo made you feel like an everyman super-soldier, Destiny emphasises that tagline of building your own legend when you craft a character. We never got the chance to build our future legend, with preset characters available instead. I grabbed a Hunter and got to work in some six on six multiplayer action in Control. This is where Destiny really shone, as Bungie’s continued efforts on making the game feel better when social actually do work. In Control, players need to get their teams to fight it out for territory over several points, with the core shooter mechanics feeling polished in the Rusted Lands maps. It’s very tight action, with Sparrows zipping everywhere and legends dying over and over again as the battle raged on. In other words, damn good fun from Bungie who know a thing or two about addictive multiplayer sessions. Deep down, Destiny feels very nostalgic, but with enough of a new-gen shine to feel at home with other shooters on the market, and maybe even outclass them. Time will still tell if this is indeed the future of shooter games, as it attempts to transcend the genre. But as a social hub where the action is thick and the universe is massive? Destiny could very well be the game that starts a new benchmarking genre and franchise as we head off into uncharted territory on new consoles and hardware. The game is out on Xbox One, Xbox 360, PS4 and PS3 on September 9th, but don’t forget to pre-order so that you can get an early taste with the upcoming Beta. Geoff’s write up on the alpha will be coming along later today.